Here's one for our beloved UK-based readers—the new Moto X is on sale with a pretty reasonable discount on your side of the Atlantic, but you'll have to act fast. 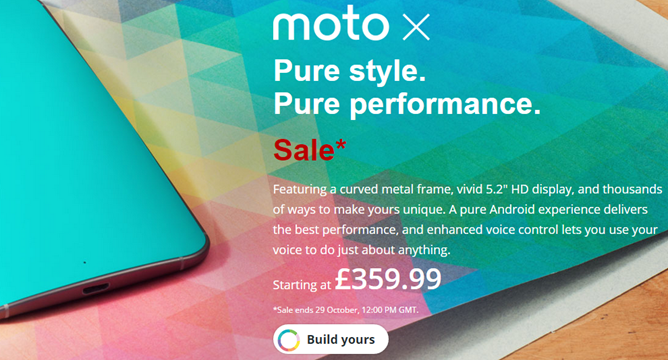 Until tomorrow, October 29th at noon, you can get the Moto X for £359.99 (£60 off). This deal doesn't require any coupon codes or registration. Just head over to the Moto Maker page on Motorola's UK site and design a phone. The price includes VAT and standard shipping on the standard GSM unlocked model. For any curious Americans, the sale price works out to about $580. That's certainly more pricey than the US version, but at least it's on sale.